Neil French's sudden non-appearance at a Singapore AdAsia conference, held November 21-23, isn't news. What's news are comments he made in a Singapore newspaper article run a day prior to the show in which he tried to claim it's not just woman who are "crap" because they make time for family, it's men too. French claims, according to Ad Age, children are "incompatible with the long hours needed to become a top creative." Egoistically proving his point and hinting fatherhood is for wimps, French told the paper he hasn't seen his only child, an eight year-old boy in months. 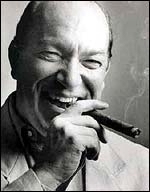 Keep smokin' that cigar, Neil but humbly suggest you give that Harry Chapin song, Cats in the Cradle, a listen. It's got an important message for you. Of course, one could claim the above is written from an overly PC, American viewpoint. If you flip the coin and acknowledge cultural differences between America and Singapore, where French has spent most of his career, French comes out smelling like roses as indicated by a comment reportedly made by a creative who said, during a dinner attended by French and, we assume, the Ad Age reporter who reported it, "You have to look at this through a cultural filter. In Singapore, its still legal to beat your wife." While we find that hard to believe, we're not making it up. 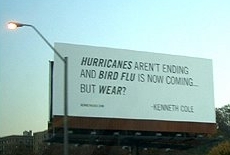 Kenneth Cole tries its hand at cultural relevance with a new billboard on New York's West Side Highway which carries the headline, "Hurricanes Aren't Ending And Bird Flu in Coming...But Wear?" Uh...OK...funny. Political satirist, former correspondent for Comedy Central's The Daily Show with Jon Stewart and current contributor to NBC's Today Show, Mo Rocca has been tapped by Best Buy and has produced a goofy version of some Christmas carol, which, maddeningly, we can't seem to name, to, yes, promote all the goodies Best Buy would like us all to buy for Christmas. There's even a Geek Squad version of the video too. Good stuff. Today, Buick launched a campaign, called "Beyond Precision," for its new 2006 Lucerne. Television spots focus on the exactitude with which the car is crafted which is not necessarily a new message but seems to work in this case. After all, there's not much else about a Buick that's all that exciting. At least we can be excited about the car's ad campaign. A series of print ads will launch on Nov. 22 in USA TODAY and Nov. 23 in the New York Times and Wall Street Journal; and will run throughout the year in a variety of magazines and newspapers. Interactive inserts, coined "Buzz Prints," that feature product attributes of the Lucerne will begin running in publications in February. Additional campaign components include online advertising and promotional placements on prime time shows. Two of the spots can be viewed here and here. Promoting Microsoft's Windows Media Center, Switch Interactive has borrowed an oddity from the Guinness Book of World Records. Swift found Mike "The Milkman" Moral, former holder of the "longest milk squirt from eye," and latched onto his bid for a comeback tying it into a promotion for the Windows Media Center. The effort, which consists of a site with several videos, games and all the other usual stuff chronicles Moral's bid to return to the pages of Guinness. It works. It kept us engaged long enough to want to go drink a glass of milk. See, we didn't even make any comments about the Guinness Milkmaid Mammary Milk Squirt contest. This is just not that exciting but we give kudos to Sony Europe for rehashing the cheesy Saturday morning cartoon commercial style for the 72 billionth time. This has absolutely nothing to do with advertising unless, of course, this person starts stringing lights for marketers (which he did). You have to marvel at the relentless dedication and months of preparation something like this requires. Following a MediaPost Real Media Riff's column that roasted Ad Age for an editorial cover wrap attached to 1,000 copies of the magazine distributed at ad:tech in early November, Ad Age's Rance Crain, today, offers up a mea culpa and apologizes for what MediaPost deemed a serious ad/edit line crosser. Apparently unbeknownst to the magazine's management, including Crain and Editor Scott Donaton, a last minute deal was struck between someone at Ad Age and a company called SpecificMEDIA to adhere a front page cover wrap that appeared to look like news content and distribute it at ad:tech. 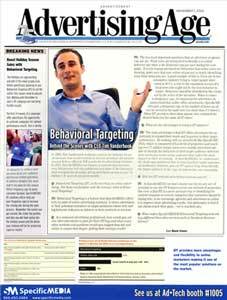 Crain writes David Klein, publishing and editorial director of the Ad Age Group, sent an email to the magazine's staff stating, among other things, the publications credibility had been damaged by the wrap. Crain also makes no excuses for misjudgment. In a nod to an American Business Media "Editorial Integrity: Under Assault?" panel Crain moderated last week, he noted readers have increased protection from "overzealous advertisers" by blogs and other journalists who will call out moves such as this cover wrap debacle. It's encouraging that Ad Age chose to publicly deal with this issues as it could very easily have simply swept it under the rug and moved on. Welcome to the conversation, Ad Age. ihaveanidea.org has partnered with Imported Artists Film Co. to launch its third annual creative competition titled the TigerGaming Advertising Challenge. The competition, now to the general public and not just advertising students, will ask contestants to take a relatively new brand, TigerGaming, and make it famous by running the winning idea as a television spot produced by Imported Artists. The contest promises over $40,000 in prizes. The Grand Prize winner gets their winning idea shot and produced by Imported Artists Film Company and $1000 cash. Second Prize winner(s) will get Apple's video iPod, while the Third Prize winner(s) will receive an iPod nano. The judges will be representatives from TigerGaming.com, Imported Artists and ihaveanidea. To be eligible entries must be received on or before Friday February 24th 2006 to ihaveanidea. Winners will be announced on Friday March 10th 2006. Early this year, Cadillac launched a campaign which consisted of five second commercials and a contest where people could submit their own five second creation with the best one winning a Cadillac CTS-V. This week, America Online and FOX are taking the five second spot out of the realm of novelty and institutionalizing it with a buy on FOX's Prison Break. The five second ad will air as the last spot in a pod, a position negotiated buy AOL media agency, Initiative. AOL's Senior VP of Brand Marketing Richard Taylor hopes to negotiate deals with other networks to air the five second unit.